Results suggest that the Buffered Winner alternative may tilt toward risky equities compared to the Winner strategy. How do the strategies translate into portfolio outcomes? Reallocate/rebalance at the close on the last trading day of each month (assume that total five-month past returns for the ETFs can be calculated just before the close). For net values, trading (switching) friction is 0.25% of the balance whenever there is a change in holdings. Results indicate that a buffer on past return measurement does suppress switching, most effectively for buffers up to 4%. The 4% and 5% buffers are optimal for terminal value, due mostly to differences in asset selection rather than suppression of switching frictions. 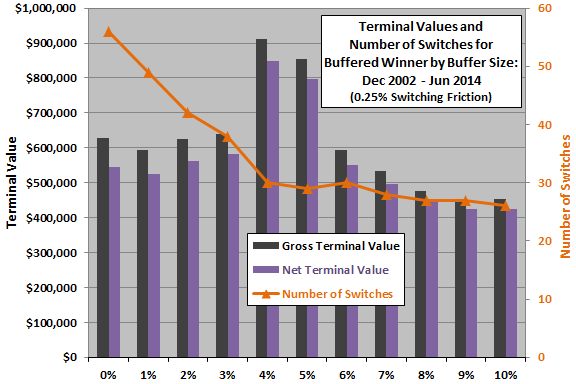 Other buffer sizes have little effect (but reduced switching may be meaningful tax-wise). The sharpness of the improvement in terminal values for buffers of 4% and 5% suggest luck in asset selection rather than some fundamental importance of the buffer size. For deeper perspective we compare net cumulative performances for different buffer sizes. 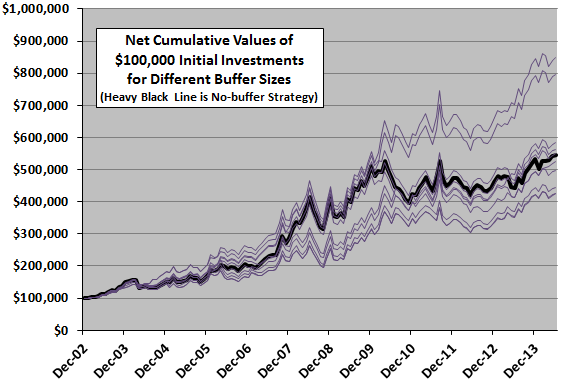 The final chart compares net cumulative values for the Buffered Winner strategy across the range of buffer sizes used above. The heavy black line corresponds to a buffer of 0% (the base Winner case). The two outperforming cases correspond to buffers of 4% and 5%, with outperformance of both relative to the base Winner case concentrating in 2010. 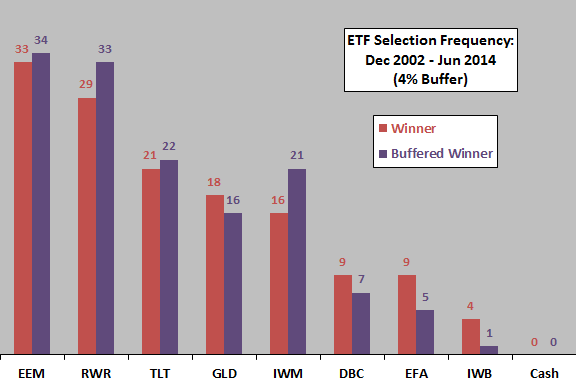 The 4% Buffered Winner case outperforms (underperforms) the Winner case during 18% (11%) of months. There are seven (three) months during which the 4% Buffered Winner case outperforms (underperforms) the base Winner case by at least 4%. To the extent that there is some fundamentally/persistently superior (not just lucky) buffer size, an investor would prefer a 4% or 5% buffer. Concentration of outperformance in a few months suggests luck. In summary, evidence from a limited sample period and simple tests offers a little support for belief that holding onto a past winner until a new winner beats it by some margin can improve performance of the Simple Asset Class ETF Momentum Strategy. As noted, sample size is modest (about 29 independent five-month momentum ranking intervals for five ETFs and fewer for three others). As noted, buffer size optimization introduces data snooping bias, which is especially pernicious for small samples. Concentration of outperformance for optimal buffer sizes and lack of systematic variation of performance across buffer sizes undermine belief that differences in performance are fundamental rather than lucky. The Buffered Winner tilt toward risky equities may be harmful at the onset of equity bear markets.